According to information recently filed with the State of California Secretary of State and posted by Election Track, Assemblymember Jim Cooper (D - Elk Grove) raised $279,603 for the period between June 30 and November 30, 2017. The cash payments came from 162 contributors. 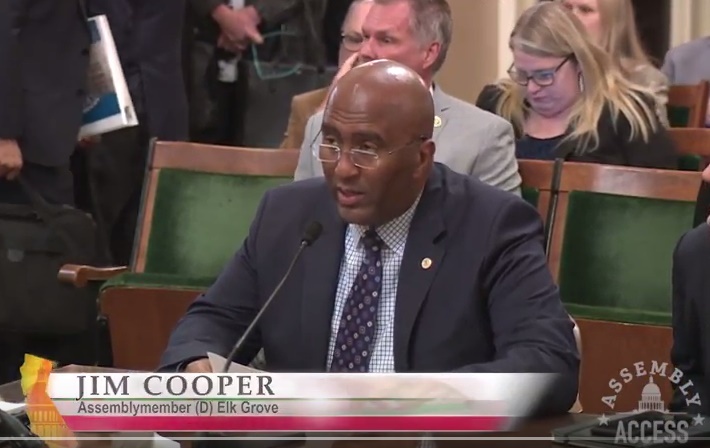 Cooper represents California's 9th Assembly District which includes Elk Grove, Galt, Lodi, and portions of Sacramento and unincorporated areas of Sacramento and San Joaquin counties. First elected to the Assembly in 2014, Cooper is seeking his third term in 2018. Before his Assembly election, Cooper served as an Elk Grove City Council Member for 14 years and retired from the Sacramento County Sheriff's Department following a 30-year career upon his election to the Assembly in 2014.
Cooper's career has more him favorable to legislation supported by law enforcement agencies and district attorneys. Among law enforcement-oriented legislation that Cooper has sponsored has been a bill that would have limited the sale of butane to curb explosions at illegal hash oil production sites and one that would collect DNA samples for specific types of misdemeanor arrests. The butane hash oil bill was vetoed by Gov. Jerry Brown and the DNA bill, Assembly Bill 16, has stalled in committee. AB 16 was first introduced in 2016 and reintroduced in the latest session. During this reporting period, Cooper also collected $14,400 from six bail bond firms. Reforming the bail bond industry, which is opposed by law enforcement, has become a topic that has taken on greater significance as a social justice issue in recent years. A state Senate bill has been introduced that has the backing of Gov. Jerry Brown and California Supreme Court Justice Tani Cantil-Sanauye. Not surprisingly, the bail bond industry opposes the legislation. Another industry group contributing were six Indian casinos who gave Cooper $14,800. Last summer Cooper successfully shepherded the state gaming compact for the proposed Wilton Rancheria casino proposed for Elk Grove that was signed into law. The largest contribution Cooper received was $8,800 from the California State Council of Laborers Small Contributor Committee and 13 contributions of $4,400. One of the $4,400 contributions came from Altria Client Services, a subsidiary of Altria, the company formerly known as Phillip Morris, which if the world's largest manufacturer and marketer of a wide variety of tobacco products including Marlboro cigarettes. Cooper received that contribution on October 10, but it appears to have been returned on October 23.
Cooper reported cash on hand of $845,520 as of June 30. Below is a list of each contribution as reported by Election Track. "You can't get rich in politics unless you're a crook"
If my count is right, it looks as though Mr. Cooper received contributions from 10 pawn shops and jewelry and loan companies. Also, it looks like he took money from a payday lender, also known as Shylocks. Is there some pending legislation regarding payday lenders and or pawn shops? It would be highly disappointing to learn Mr. Cooper was dabbling with those type of businesses.